Home » IN-VITRO EVALUATION OF ORODISPERSSIBLE FILM OF ALLIUM SATIVUM LINN. IN-VITRO EVALUATION OF ORODISPERSSIBLE FILM OF ALLIUM SATIVUM LINN. School of Pharmacy, “Dnyanteerth”, Vishnupuri, Swami Ramanand Teerth Marathwada University, Nanded - 431606, Maharashtra, India. ABSTRACT: The treatment of cancer up to the saving of life of cancer patient is rare miracle. Cancer is deadly disorder (some cancers are diseases caused by viruses) if diagnosed in second or third stage leads to death, hence it is better to prevent it. The present study emphasizes on prevention of cancer rather than cure. Extraction of garlic was carried out by using maceration process. The liquid extract was concentrated under vacuum at 25 °C. Concentrated extract was exposed to UV light and packed in a suitable container for use in formulation development. Orodisperssible film formulation was developed by solvent casting method. In-vitro activity was evaluated on different cancer cell lines like human colon cancer cell line (COLO 205) and human prostate cancer cell line (PC-3). As compared to standard drug, Adriamycin (Doxorubicin) of allopathic origin, orodisperssible film formulation containing hydro-alcoholic garlic extract shows comparable tumor suppressive activity. Hence, orodisperssible film formulation containing stabilized garlic extract will find its place in nutraceutical market. To warrant further tumor suppressive activity shall be done in-vivo to determine safety, efficacy, mechanism of action of Allium sativum Linn., anti-carcinogenic effect etc. INTRODUCTION: The estimated future cancer burden will probably be considerably larger because of lifestyles changes, like as increase in smoking habits, poor diet, lack of physical activity and fewer pregnancies in economically developing countries like India 1. In 424 B.C. Hippocrates, have made a statement “Your food shall be your medicine and your medicine shall be your food”. This is very true for the successful treatment of the cancer 2. In response to fulfil the future need, it is necessity of the time to investigate and develop the nutraceutical for cancer prevention, which can fulfil voids of allopathic medication by early diagnosis and prevention of cancer with its daily intake in diet or to avoid recurrence of cancer in suitable dosage forms. Use of nutraceuticals in cancer prevention will take less time in development and manufacturing as compared to allopathic medications (New Chemical Entity). Many food components and nutrients have been found to be effective in cancer prevention in the past few years. Current investigation will comprise food components and nutrients in orodisperssible dosage forms for cancer prevention. Considering success and failure rate of cancer treatment by allopathic medicines, there is necessity to investigate cancer preventive potential of nutraceutical formulation 3. It is widely accepted that almost 80-90% of human cancer is due to environmental factors. Environmental factors from a scientist’s standpoint include external factors (which are not genetic) such as smoking, diet, infectious diseases as well as chemicals and radiation in homes and workplaces 4, 5. Cancer is a preventable disease to an extent. Preventive nutrition is very effective for people with cancer. Eating well while undergoing cancer therapy will be helpful to feel better, keep up strength and energy, tolerate treatment-related side effects, heal and recover quickly. Eating well means eating a variety of foods that provide nutrients an individual needs to maintain health while fighting cancer 6. Beneficial nutraceutical components block hormone actions and metabolic pathways as well as acts as free radical scavenger that is associated with the development of cancer 7, 8. Vital ingredients used in Indian cooking include turmeric, cloves, ginger, aniseed, mustard, saffron, cardamom and garlic 9. Organosulfur compounds and possible mechanism of garlic in cancer 10. Ajoene, garlic stable oil soluble, sulphur rich compound possess potent anti-mitotic and microtubule interaction properties 11. Nutraceuticals contains antioxidants which act as free radical scavenger to inhibit over expression of normal oncogenes, or under-expression or disabling of tumor suppressor genes. In the present study, extraction and in-vitro evaluation of orodilsperssible films of Allium sativum Linn. for cancer prevention is performed. MATERIALS AND METHODS: Hypromellose (Methocel E3 Premium LV) from Dow Chemical’s Mumbai, polyvinyl alcohol from S. D. Fine Chemicals Ltd., Mumbai. Macrogol 400 from Spectrum Chemicals Mumbai, mannitol (Pearlitol 25 C) from Roquette, glycerin (Pricerine 9093) from CRODA India Pvt. Ltd., Navi Mumbai, India was procured as gift sample. Vitamin C, zinc sulphate monohydrate. Elemental selenium, steviose and menthol (Levo-Menthol) were obtained as gift sample from Omni Active Health Technologies Ltd. Thane. Simethicone emulsion 30% were obtained from Thurs Organic Pvt. Ltd., Mumbai, titanium dioxide were purchased from Bimal Pharma Pvt. Ltd., Mumbai, red beet root colour were purchased from Herbo Nutra Delhi India. All the chemicals and reagents used were analytical grade. The crude garlic cloves was collected from Nanded (Maharashtra), India and authenticated by the Scientist of the Botanical Survey of India, Pune (India). Preparation of Garlic Extract: Authentic crude garlic cloves (100 g) of Allium sativum was dried under shade. Unpeeled dried garlic cloves. Using a mechanical grinder crushed the cloves of garlic and transferred the contents into a beaker. Coarsely crushed garlic was defatted using petroleum ether (200 ml). Defatted garlic was extracted by maceration technique. In this process, the defatted garlic was placed in a closed container with the water and alcohol (80:20) as solvent with a ratio of 1:1 and allowed to stand at room temperature for 3 days with occasional shaking until the soluble matter has dissolved. The mixture then was strained, marc (the damp solid material) was pressed and the liquid extract was clarified by vacuum pump filtration through Whatman no.1 filter paper after standing. The same procedures were repeated several times to get sufficient quantity of liquid extract. The liquid extract was concentrated under vacuum at 25 °C for 48 h using rotatory evaporator (Heidolph™ 560-01300-00). Concentrated semi-solid extract was exposed to UV light and packed in a wide mouth amber colour glass container for use in formulation development. Lastly, the concentrated garlic extracts were kept in a refrigerator at 5 ± 3 °C throughout the study 12. Ninhydrin Test: In the pH range of 4-8, all α- amino acids react with ninhydrin (triketo-hydrindene hydrate), a powerful oxidizing agent to give a purple colored product (diketohydrin) termed rhuemann’s purple. All primary amines and ammonia react similarly but without the liberation of carbon dioxide. The α-amino acids typically give a blue-purple product. Proline, a secondary amine, gives a yellow-orange product. Garlic extract when treated with ninhydrin shown rhuemann’s purple colour 13. Qualitative Analysis of Sulphur containing Amino Acids (Cysteine and Cystine) by Lead Sulphide Test: Sulphur containing amino acids, such as cysteine and cystine, when boiled with sodium hydroxide (hot alkali), yields sodium sulphide. This reaction is due to partial conversion sulphur to inorganic sulphide, which is detected by precipitating it to lead sulphide, using lead acetate solution of the organic. Determination of Total Ash: Incinerated about 2 g accurately weighed sample in a tarred silica dish at a temperature not exceeding 450 °C until free from carbon, cool and weighed. As a carbon free ash cannot be obtained in this way, charred mass were exhausted with hot water, residue were collected on an ash less filter paper. Residue and filter paper were incinerated, added the filtrate, evaporated to dryness, and ignited at a temperature not exceeding 450 °C. Calculated the percentage of ash with standard to the air-dried sample. Calculated percentage ash on an ODW basis. Determination of Acid-Insoluble Ash: 25 ml of dilute hydrochloric acid were added in to the crucible containing total ash. Insoluble matter were collected on an ash less filter paper (Whatman no. 41) and washed with hot water until the filtrate was neutral. Insoluble matter was transferred from filter paper to the original crucible, dried on a hot-plate and ignited to constant weight. The residue were allowed to cool in a suitable desiccator for 30 min and weighed without delay. Calculated the content of acid insoluble ash with standard to the air-dried sample. Determination of Water Soluble Ash: Ash were boiled the for 5 min with 25 ml of water; insoluble matter were collected in a Gooch crucible, washed with hot water and ignited for 15 min at a temperature not exceeding 450 °C. Subtracted the weight of the insoluble matter from the weight of the ash, the difference of weight from weight of the ash and insoluble matter represents the water-soluble ash. Calculated the percentage of water-soluble ash with standard to the air-dried sample. Determination of Sulphated Ash: Silica crucible were heated to redness for 10 min, allowed to cool in a desiccator and weighed. Kept accurately weighed 1 g of the substance into the crucible, ignited gently at first, until the substance were thoroughly charred. Cooled and moistened the residue with 1 ml of sulphuric acid, heated gently until white fumes were no longer evolved and ignited at 800 ± 25 °C until all black particles had disappeared. Ignition must be conducted in a place protected from air currents. Allowed the crucible to cool, few drops of sulphuric acid were added and heated. Ignited as before, allowed repeated cooling and weighing. Repeated the operation until two successive weighing did not differed by more than 0.5 mg. Determination of Alcohol Soluble Extractive: 5 g of the air dried sample was macerated with 20 ml of alcohol the specified strength in a closed flask for 24 h, shaken frequently during six hours and allowed standing for eighteen hours. Filtered rapidly, taking precautions against loss of solvent, evaporated 5 ml of the filtrate to dryness dish, and dried at 105 °C, to constant weight and weighed. Calculate the percentage of alcohol soluble extractive with standard to the air-dried sample. Determination of Water Soluble Extractive: 1 g of the air dried sample was macerated with 20 ml of chloroform-water the specified strength in a closed flask for 24 h, shaken frequently during six hours and allowed to stand for eighteen hours. Filtered rapidly, taking precautions against loss of solvent, evaporated 5 ml of the filtrate to dryness in a tarred flat bottomed shallow dish and dry at 105 °C to constant weight and weighed. Calculated the percentage of water soluble extractive with standard to the air-dried sample. Procedure Set Forth Here Determines the Amount of Volatile Matter: Placed about 2 g of sample (without preliminary drying) after accurately weighing (accurately weighed to within 0.01 g) in a tarred evaporating dish. After placing the above said amount of the sample in the tarred evaporating dish, dried it at 105 °C for 5 h and weighed. Continued the drying and weighing at one hour interval until difference between two successive weighing corresponds to not more than 0.25 per cent. Constant weight were reached when two consecutive weighing after drying for 30 min and cooling for 30 min in a desiccator, showed not more than 0.01 g difference. Results for purity test of garlic extract of Allivum sativum Linn are shown in Table 6. Stability Improvement of Garlic Extract: Appropriate quantities of vitamin C (5 times of concentrated garlic extract), zinc sulphate monohydrate (3.33 times of concentrated garlic extract) and elemental selenium (0.013 times of concentrated garlic extract) were added to the 9.00 gm of concentrated garlic extract. Concentrated garlic extract (9 g) along with vitamin C 45.00 g, zinc sulphate monohydrate 30.00 gm and Selenium 0.013 g here after described as stabilized garlic extract (stabilized garlic extract = Concentrated garlic extract + vitamin C + zinc sulphate monohydrate + Elemental selenium: 84.013 g = 9.00 g + 45.00 g + 30.00 g + 0.117 g) and it was used in formulation. It was exposed to UV light and packed in suitable container for use in formulation development as it is 16, 17. Following process describes preparation of 10% w/w disperion in distilled water (for solid content of 45 mg of each Orodisperssible film, 40.5 mg of distilled water were used). Composition of Orodisperssible films are shown in Table 1. Batch size were kept of 1000 orodisperssible films. Step I: “Stabilized garlic extract” (1.50 g) was added to distilled water (20.50 g). Then Sime-thicone emulsion (0.04 g) was added to form a homogeneous dispersion under continuous stirring. Macrogol 6000 (0.50 g) and mannitol (Pearlitol 25 C) (10.39 g) were added to the prepared homogeneous dispersion under continuous stirring and dispersed. Steviose (1.00 g) was added and dispersed. Step II: Hypromellose (Methocel E3 Premium LV) (16.00 g) was added in distilled water (20.00 g) and the dispersion was stirred for 1h thereby allowed the polymers to hydrate. Step III: The dispersion prepared in step II was added to step I and mixed under continuous stirring. Step IV: Glycerin (Pricerine 9093) (1.50 g), polyvinyl alcohol (0.50 g), red beet root colour (0.05 g), titanium dioxide (0.50 g) and menthol (0.50 g) was added to the dispersion of step I and dispersed. Step V: Films were casted using the dispersion prepared in step IV. The films were dried, cut and packed in aluminium pouch. During drying water was removed from the product 18, 19, 20, 21. 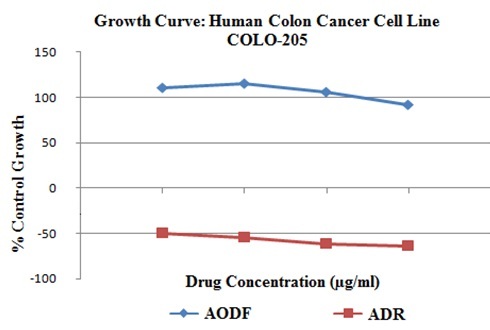 Determination of In-vitro Anticancer Activity on Human Colon Cancer Cell Lines-COLO 205: The detailed information about human colon cancer cell lines, test and standard sample are shown in Table 2 and Table 3 respectively. Preparation of Samples: Accurately weighed 3000.15 mg of prepared garlic orodisperssible filmss (equivalent to 100 mg of the concentrated garlic extract) was dissolved in sufficient quantity of distilled water with the aid of 1 ml of dimethyl sulfoxide and then diluted to 1 mg/mL using water. For 100 mg the volume was made up to 100 ml to get stock solution of 1000 µg/mL and stored frozen prior to use. An aliquot of frozen concentrate was thawed and samples of 10 µg/mL, 20 µg/mL, 40 µg/mL, 80 µg/mL were prepared by diluting 0.1, 0.2, 0.4 and 0.8 ml of stock solution up to 10 ml with distilled water respectively. Similarly Adriamycin (Doxorubicin) used as positive control were prepared using distilled water. Then these samples were added in wells of respective petri-plates of cell line culture and incubated at 37 °C for 72 h in CO2 incubator (environment of 5% CO2 concentration). The experiment was performed in triplicate. Similarly standard drug, Adriamycin was also incubated. Method of Testing: SRB (Sulforhodamine B) assay. Source of Cell Line: National Cancer Institute, Frederick, USA. Concentration of Drug Used: 10 µg/mL, 20 µg/mL, 40 µg/mL and 80 µg/mL. Solvent Used: Dimethyl Sulfoxide (DMSO) and distilled water. Firstly cell lines (COLO 205) were cultured in medium RPMI 1640 containing 10% fetal bovine serum, 2 mM L-glutamine and inoculated into 96 well microtiter plates in 100 μl at plating densities. Cells are plated in 96-well flat bottom plates at 5000 cells/well. Microtiter plates were allowed to adhere to the wells overnight by incubation at 37 °C, 5% CO2, 95% air and 100% relative humidity for 24 h prior to addition of samples. The samples were added to triplicate wells in serial. The plates with samples were incubated at standard conditions (37 °C, for 72 h in CO2 incubator - environment of 5% CO2 concen-tration) and assay was terminated by the addition of cold TCA (trichloroacetic acid). 50μl of cold 30% (w/v) TCA (trichloroacetic acid) to final concentration, 10% TCA was added to fix the cells in situ and incubated for 60 min at 4 °C. Supernatant fluid was discarded; plates were washed five times with de-ionized water and air dried. The wash removes excess fixative and serum proteins. In each well sulforhodamine B (SRB) dye solution (200 μl at 0.4% w/v in 1% acetic acid) was added and it was incubated for 30 min at room temperature. Once staining is completed, unbound dye was recovered and the unbound sulforhodamine B (SRB) dye was removed by washing five times with 1% acetic acid. Measured the absorbance at 565 nm, with a micro-plate reader (Molecular Devices). The percentage growth was calculated on a plate-by-plate basis for sample wells relative to control wells. Standard anticancer drug, Adriamycin (Doxorubicin) was used as positive control. The percentage growth increase in cancer cells was calculated at each sample concentration level by using the six absorbance measurements [time zero (Tz), control growth (C), and test growth in the presence of sample at the four concentration levels (Ti)]. The % growth was calculated by using following formula. Percentage growth inhibition, growth inhibition, total growth inhibition (TGI) and LC50 was calculated. Percentage growth inhibition (GI50) was calculated as [(Ti-Tz)/C-Tz)] × 100 for concentration, for which Ti≥Tz (Ti-Tz) positive or zero and [(Ti- Tz)/Tz)] × 100 for concentration for which Ti<Tz (Ti-Tz) negative. Dose response parameters for each test sample were calculated. GI50; Growth inhibition of 50% was calculated from [(Ti-Tz)/(C-Tz)] × 100 = 50. The drug concentration giving total growth inhibition (TGI) was calculated from Ti=Tz. The LC50, concentration which inhibits 50% of protein measured from beginning was calculated from [(Ti-Tz)/Tz)] × 100 = -50. If the compound is pure then GI50 value of ≤ 10-6 (i.e. 1 μmole) or ≤ 10 μg/mL is considered is indicative of demonstrable activity and in case of extracts, GI50 value ≤ 20 μg/mL is considered to demonstrate activity. Above three parameters were calculated only when the level of activity was observed. The values were expressed as greater or less than maximum or minimum concentration tested when the effect was not reached or exceeded 22, 23. GI50 (Growth inhibition of 50 %) - Growth inhibition of 50 % (GI50) calculated from [(Ti-Tz)/(C-Tz)] × 100 = 50, drug concentration resulting in a 50% reduction in the net protein increase. TGI (Total Growth Inhibition) - Drug concentration resulting in Total Growth Inhibition (TGI) will calculated from Ti = Tz. LC50 (Lethal Concentration 50) - Concentration of drug resulting in a 50% reduction in the measured protein at the end of the drug treatment as compared to that at the beginning) indicating a net loss of 50% cells following treatment is calculated from [(Ti-Tz)/Tz] × 100 = -50. ADR - Adriamycin (Doxorubicin) used as positive control drug. All GI50 values are average of 3 experiments. Compound with GI50 value of ≤ 10-6 (1 µ Molar) or ≤ 10 µg/mL is considered to demonstrate activity in case of pure compound. GI50 value ≤ 20 µg/mL is considered to demonstrate activity in case of extracts. Determination of In-vitro Anticancer Activity on Human Prostate Cancer Cell Lines-PC-3: The detailed information about human prostate cancer cell lines, test and standard sample are shown in Table 4 and Table 5 respectively. Source of Cell Line: NCCS (National Centre for Cell Science), Pune. Concentration of Drug Used: 10 µg/mL, 20 µg/mL, 40 µg/mL & 80 µg/mL. Preparation of Samples: Accurately weighed 3000.15 mg of prepared garlic orodisperssible films (Equivalent to 100 mg of the concentrated garlic extract) was dissolved in sufficient quantity of distilled water with the aid of 1 ml of dimethyl sulfoxide and then diluted to 1mg/mL using water. For 100 mg the volume was made up to 100 ml to get stock solution of 1000 µg/mL and stored frozen prior to use. An aliquot of frozen concentrate was thawed and samples of 10 µg/mL, 20 µg/mL, 40 µg/mL, 80 µg/mL and 100 µg/mL, 200 µg/mL, 400 µg/mL, 800 µg/mL were prepared by diluting 0.1, 0.2, 0.4 & 0.8 ml & 1, 2, 4 & 8 ml of stock solution (concentration 1000 µg/ml) up to 10 ml with distilled water respectively. Similarly Adriamycin (Doxorubicin) used as positive control were prepared using distilled water. Then these samples were added in wells of respective petri-plates of cell line culture and incubated at 37 °C for 72 h in CO2 incubator (Environment of 5% CO2 concentration). The experiment was performed in triplicate. Similarly standard drug, Adriamycin (Doxorubicin) was also incubated 22, 23. Cell viability measurement performed using same procedure as mentioned for in-vitro anticancer activity on human colon cancer cell lines. Ethical Approval: Permission and ethical clearance were taken to carry out these in-vitro anticancer activities from the Institutional Review Board (IRB) of the Advanced Centre for Treatment Research and Education in Cancer (ACTREC), Tata Memorial Centre. Phytochemical Screening: Preliminary phyto-chemical test for garlic extract of Allium sativum Linn showed the presence of amino acids specifically sulphur containing amino acids viz., cysteine and cystine as evidenced by lead sulphide test. TABLE 6: RESULTS FOR PURITY TEST OF GARLIC EXTRACT OF ALLIVUM SATIVUM LINN. In-vitro Anticancer Activity: Anticancer efficacy of garlic orodisperssible film was screened using human colon cancer cell line (COLO-205) at 10, 20, 40 and 80 (μg/mL) concentrations Table 7 and human prostate cancer cell line (PC-3) at 10, 20, 40, 80 (μg/ml) and 100, 200, 400, 800 (μg/mL) concentrations and these concentration in combination with standard drug Table 8. From Fig. 1 and Fig. 2 it was evident that there was parallel cancer cell growth inhibition of test formulation versus standard with increasing dose concentration from 10, 20, 40 & 80 µg/mL. Though for human colon cancer cell Line (COLO-205), there is comparatively lesser % control growth inhibition [92.0 (AODF: 80 μg/mL) vs. -63.7 (ADR: 80 μg/mL)] but for human prostate cancer cell line (PC-3), 84.7 (AODF 1: 80 μg/mL) and 77.1 (AODF 2: 800 μg/mL) vs. -40.9 (ADR: 80 μg/mL)] is significant reduction, which on prolonged use will show more promising results. Whereas AODF 1+ADR and AODF 2 + ADR (combination of test product with standard product) shows synergistic effect as evidenced by reduced % control growth of -36.7 and -34.3 vs. -40.9 (ADR: 80 μg/mL) respectively. Garlic orodisperssible film formulation inhibited percent control growth of all the cell lines in dose dependent manner. The median growth inhibition (GI50) values for human colon cancer cell line (COLO-205) and human prostate cancer cell lines (PC-3) are -12.10 (AODF) and 9.42 (AODF 1), 8.38 (AODF 2), 19.76 (AODF 1 + ADR) and 18.95 (AODF 2 + ADR) are ≤20 μg/mL hence, considered to demonstrate activity. Previous studies have showed that plant extract contains abundant number of phytochemicals which possess potential anticancer properties and might be responsible for anticancer effect of these plants extract. Garlic is rich in various sulphur containing chemical constituents. Two major groups that shows anticancer effects have been identified. One group is the water-soluble compounds c-glutamyl S-allylcysteine group such as S-allylcysteine (SAC) and S-allylmercaptocysteine (SAMC) and the other one is the lipid-soluble allyl sulfur compounds such as diallyl disulfide (DADS) and diallyl trisulfide (DATS). The presence of S-allylmercaptocysteine (SAMC) may be attributed to anticancer effect of Allivum sativum Linn. S-allylmercaptocysteine (SAMC) prevented colon cancer cell growth by 71% by disrupting cellular microtubules that form the cytoskeleton and the mitotic spindle in cells, thus disrupting cell division. S-allylmercapto-cysteine (SAMC) also induced cell suicide (apoptosis) in the colon cancer cells, by activating apoptosis signalling pathway enzymes, including caspase that ultimately kills the cells 24, 25. CONCLUSION: The findings of the present study suggest that orodisperssible formulation containing stabilized garlic extract from Allium sativum Linn. bulbs possesses promising cancer preventive properties for colon cancer & prostate cancer, which was evident by the decreased growth of colon cancer cells (concentration of 80 µg/mL) & prostate cancer cells (concentration of 800 µg/mL), test sample versus growth of cancer cells in control condition. Further in-vivo studies are necessary to confirm cancer preventive properties of Allium sativum Linn. bulbs to determine the safety, efficacy, mechanism of action of Allium sativum Linn., anti-carcinogenic effect etc. The present study was carried out to explore in-vitro anticancer potential of garlic extract of Allium sativum Linn., against colon cancer & prostate cancer. Further research works are in view to perform in-vivo evaluation of orodispersible film of Allium sativum Linn. in colon tumor induced mice. ACKNOWLEDGEMENT: We are duly thankful to the anti-cancer drug Screening facility, Advanced Centre for Treatment Research and Education in Cancer (ACTREC), Tata Memorial Centre, Kharghar, Navi Mumbai - 410208, Maharashtra (CPCSEA Registration Number: 65/GO/ReBiBt/S/ 99/CPCSEA) for hosting and providing laboratory facilities to conduct in-vitro study. The authors would like to express their gratitude to School of Pharmacy, Swami Ramanand Teerth Marathwada University authorities for providing all the facilities needed for the successful completion of this project. Global Cancer Facts and Figures. American Cancer Society, Edition 3rd, 2018. William DK: One Answer to Cancer. Cancer Coalition for Alternative Therapies, Inc., Canada, Edition 3rd, 1999. Sinha R, Anderson DE, Mc Donal SS and Greenwald P: Cancer Risk & Diet in India. J Postgrad Med 2003; 49: 222-228. Dixit S and Ali H: Anticancer activity of medicinal plant-A Review. J Chem & Cheml Sci 2010; 1: 79-85. Ajeet, Prakash O, Kumar A and Kumar P: Anticancer potential of plants and natural products: A review. American Journal of Pharmacological Sciences 2013; 1 (6): 104-115. Nutrition for people with cancer. Canadian Cancer Society. http://www.cancer.ca/en/cancer-information/cancer-journe y/living-with-cancer/nutrition-for-people-with-cancer/?reg ion=qc. Mohammad A, Faruqi FB and Mustafa J: Edible compounds as antitumor agents. Indian Journal of Science and Technology 2009; 2(5): 62-73. Ehssan HO, Moglad, Omer M, Abdalla WS, Koko and Saadabi AM: In-vitro anticancer activity and cytotoxicity of Solanum nigrum on cancers and normal cell lines. International Journal of Cancer Research 2014; 10 (2): 74-80. Sengupta A, Ghosh S, Bhattacharjee S and Das S: Indian food ingredients and cancer prevention- an experimental evaluation of anticarcinogenic effects of garlic in rat colon. Asian Pac J Cancer Prev 2004; 5(2): 126-32. Omar SH and Al-Wabel NA: Organosulfur compounds and possible mechanism of garlic in cancer. Saudi Pharma-ceutical Journal 2010; 18: 51-58. Min L, Ciu JR, Ying Y, Min J M, Zhang LH, Wang K, Gares M, Cros J, Wright M and Tack JL: Antitumor activity of Z -ajoene, a natural compound purified from garlic: anti-mitotic and microtubule interaction properties. Carcinogenesi 2002; 23: 573-579. Majekodunmi SO: Review of extraction of medicinal plants for pharmaceutical research. Merit Research Journal of Medicine and Medical Sciences 2015; 3(11): 521-527. Singh V and Kumar R: Study of phytochemical analysis and antioxidant activity of Allium sativum of Bundelkhand Region. Int J Life Sci Scientific Res 2015; 3(6): 1451-1458. Department of Ayurveda, Yoga & Naturopathy, Unani, Siddha and Homoeopathy: The Ayurvedic Pharmacopoeia of India Part - II (Formulations), Government of India Ministry of Health And Family Welfare New Delhi, Edition 1st, Vol. II, 2008: 160-161. Promod, Anu KT and Mohanlal J: Pharmacognostical and phytochemical analysis of Vanya Haridra (Curcuma aromatica) rhizomes. International Journal of Ayurvedic & Herbal Medicine 2018; 8(3): 3212-3222. Josling P: Allicin and vitamin C-power, Performance, Proof. HRC Publications; Edition 1st, 2010. Wilson L: Selenium, A critical mineral for health and development. L.D. Wilson Consultants, Inc: Edition 5th, 2017. Preis M, Pein M and Breitkreutz J: Development of a taste-masked orodispersible film containing dimenhydrinate. Pharmaceutics 2012; 4: 551-562. Basu B and Desai P: Design and evaluation of fast dissolving film of domperidon. 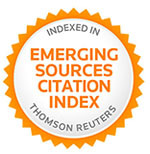 International Research Journal of Pharmacy 2012; 3(9): 134-145. Sagban T and Ismail K: Formulation and evaluation of orodispersible film of sildenafil citrate. International Journal of Pharmacy and Pharmaceutical Sciences 2014; 6 (2): 80-86. Poluri K, Mulpur E, Puttugunta S and Govada K: Formulation development and evaluation of novel oral soluble films of ziprasidone hydrochloride in the treatment of schizophrenia. 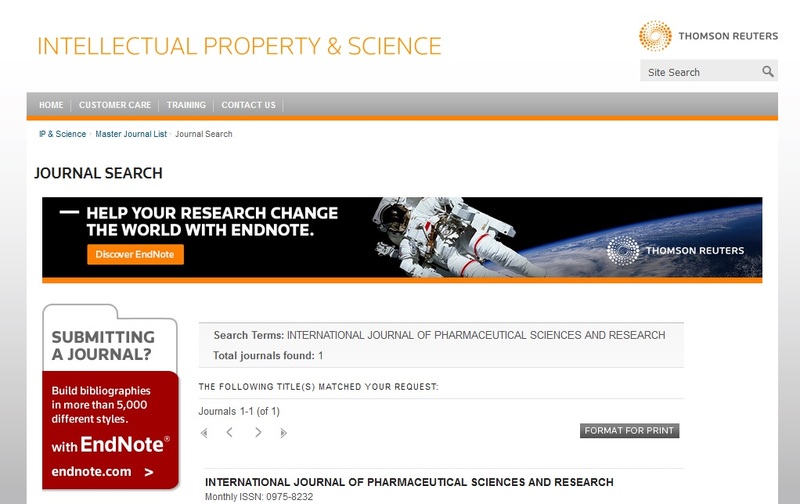 International Journal of Pharmacy and Pharmaceutical Sciences 2013; 5(2): 618-627. Gingine AP, Mandge SV and Prasad GJ: In-vitro evaluation of anticancer activity of methnaolic extract of Annona reticulata (ramphal) leaves on different human cancer cell lines. Journal of Analytical & Pharmaceutical Research 2016; 3(8): 2-3. Chavan R, Khan M, Sathe N and Mankar N: A review: SRB Assay for screening anticancer activity of herbal drugs (in-vitro). International Ayurvedic Medical Journal 2016; 4(2): 67-68. Gao C, Jiang X, Wang H, Zhao Z and Wang W: Drug metabolism and pharmacokinetics of organosulfur compo-unds from garlic. J Drug Metab Toxicol 2013; 4(5): 1-10. Abraha AM and Ketema EB: Apoptotic pathways as a therapeutic target for colorectal cancer treatment. World J Gastrointest Oncol 2016; 8(8): 583-591. Pawar DR and Butle SR: In-vitro evaluation of orodisperssible film of Allium sativum Linn. Int J Pharm Sci & Res 2018; 9(11): 4974-83. doi: 10.13040/IJPSR.0975-8232.9(11).4974-83. Authors Address: School of Pharmacy, “Dnyanteerth”, Vishnupuri, Swami Ramanand Teerth Marathwada University, Nanded, Maharashtra, India.